Windows 10 allows for creating a bootable USB Recovery / Repair Drive, allowing to repair startup, file system and other problems, running system restore, refreshing or resetting your pc. You can create a Windows 10 USB or DVD recovery drive that will allow you to access these advanced startup options, even if your Windows 10 installation becomes completely damaged and you can’t access this menu. If you run into problems with your PC, a USB recovery drive can help you troubleshoot and fix those problems, even if Windows won’t start. Note, this repair recovery drive (Advanced Start Up Repair) cannot repair problems with the hard drive itself, hard drive mechanical failure. Windows 10 by default does not allow the older method of tapping F8 on boot to boot into “Safe Mode”. (See other methods – work arounds below). Setting the computer from within the operating system to boot to safe mode yes. But on a computer that will not get into startup, this repair system repair disk is needed. A USB thumb drive can be used to create this Windows 10 recovery drive. This needs to be done before problems arise, or can be created from any other working computer running either Windows 7, 8, 8.1 or Windows 10. Can be created from any other working computer running either Windows 7, 8, 8.1 or Windows 10. Complete instructions are on the “Media Creation Tool” link above. “Create Windows 10 installation media, Download Tool Now”. 4GB usb thumb drive can used to create this installation/repair media. The usb thumb drive must be blank, empty it will also be formatted during the “Media Creation Tool” process. Creating an “iso” file must be burned to DVD. Download the “Media Tool” from above link (“Download Tool Now”). Insert USB thumb drive into pc and run the Media tool file and just follow the prompts and your Windows 10 installation files, WHICH include “Advance Start Up Repair” will be completed. AFTER creating Windows 10 installation files and “repair” boot media created with the Media Creation Tool, boot your computer from the usb or dvd media. (Bio’s setting > Boot Options). After the select language, keyboard screen, next screen your presented with is “Install”…. except you do not want “install”,,,,,, look in lower left corner of that screen and choose “Repair My Computer”. This will then take you to the advanced repair options for Windows 10. From there you have “Reset, System Restore, Safe Mode Boot, Start Up Repair” and a few other options. I used this Media Creation Tool initially to upgrade to Windows 10, so I have this thumb drive stored away if needed in the future. Also keep around for any other Windows 10 computers that will not fully boot up at least to the log on screen. Unless you have changed the motherboard out on the computer, I can confirm that once the OS has been activated (whether it was Win 7, 8.1 or 10) Windows 10 will activate automatically on installation. Note, you MUST download & create the same version of Windows 10 that you currently had activated. If you had Win 10 Home version activated, and you are creating & installing Win 10 Pro for example,,, it WILL NOT activate. With a computer last week, computer had 8.1 but was upgraded to Win 10. Hard drive was failing, but was still bootable. I checked Win 10 version and confirmed it was activated. Installed new hard drive, using Microsoft’s Media Creation Tool then created Windows 10 installation thumb drive from another pc. Installed Windows 10 and it activated automatically. If System Restore, Safe Boot Mode, “Reset” or reinstalling Windows 10 fails, a diagnostics test needs to be performed on the hard drive. If your hard drive is the problem, has failed, you’ll need a new hard drive installed to proceed with the operating system installation using the thumb drive or DVD you created with the Microsoft Media Creation Tool. iDrive – Automatic Remote Data Backup & Recovery – one service you cannot be without. Protect your important data files on ALL your devices automatically. 4th Method – Using “Msconfig”. Windows key + R > type msconfig, click “ok”… Boot tab > select “Safe Mode” Minimal, click “Apply & OK”. Restart will boot into the Advance Startup repair menu. Also I believe, 3-4 non-successful boots should automatically boot into “Automatic Start Up Repair” mode. Of course, enabling the older style “F8” safe mode function needs to be done, and left enabled BEFORE problems arise. 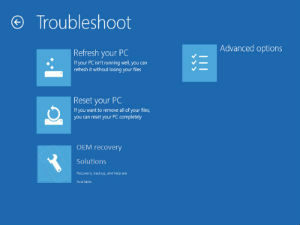 Windows 10 “recovery environment” actually provides you a few more options for repair, full recovery, reset pc, system restore, diagnostics mode etc. Much more than the older style F8 boot function. If you replace your hard drive or if Windows 10 recovery options are corrupt and do not function properly. Loading the drive image can have you back up & running very fairly quickly. Drive Imaging software creates a complete Operating System installation “snapshot” image of your entire hard drive with all programs, data and operating system at the time & date of image creation. The drive image can be saved to an external hard drive, and used as a recovery OS installation file. Best to create a complete drive image right after bringing computer home or right after building and installing all hardware drivers…. for that would be a clean operating system installation image. On a new computer or new computer build with all hardware drivers installed, and no programs, no music or no photos etc the drive image might be 5-8GB’s. On a computer that has been in service for a while with 200GB of drive space used, the compressed drive image might amount to 80GB for example. Macrium Reflect Free – “Award winning disk cloning & imaging software for free.” Excellent software, create your rescue boot disk, burn you system image for complete OS recovery reinstallation to same hard drive or new hard drive. The rescue media (disk) is created & used to boot computer up loading Macrium Reflects recovery environment, then from there you can load your OS system image file saved to usb, or external hard drive. Option in settings to set Macrium Reflect Recovery option at boot screen for a few seconds. AOMEI Backupper – Had a few problems with this one initially, but got it to work. Macrimum Reflect is much easier. There are a other drive image programs including Acronis True Image. Important task to do with creating an operating system backup image is to, “auto verify the image” through the disk image software. This auto checks, verifies the image was created with no problems. Also to actually test the image and the boot media created to make sure loads and works. Will not help you “down the road” if it fails to load or install if you did not test after creating it. I can not boot usb recovery drive, or dvd to access windows image backup. boot drive will boot to Windows 10, but will not fully boot to repair screen using usb fdd, or dvd made from media creation tool.